Although airsoft guns can be classed as toys, there's no denying that a lot of them are made to closely resemble the real deal. Yet, though the aesthetics may be an exact replica, there is still the sobering fact that it doesn't operate exactly like the real thing, whether it be winding a hi-cap magazine or filling gas into the grip or cylinder of a revolver. Well, recently, we've seen a number of manufacturers taking steps to make their real-steel replicas not only look and feel like its real gun counterpart, but operate just like one too. Assault rifles with blowback seem to be all the rage right now, with the WA M4 being the proverbial hot crossed-buns, with Inokatsu hot on-the-heels of WA also, and let's not forget Marui's AK74MN. So, what have Tanaka tinkering away at? Well, revolvers have always played a major part of their product line-up, so it comes as no surprise that their quest for realistic operation comes in the guise of a revolver. The charming things about revolvers are the mechanism and the whole process of placing the shells into the chamber and Tanaka have concentrated on making this experience as authentic as possible with their new M500 revolver. As you can see from the photo above, the shells are removable, but instead of filling the gas into a tank in the cylinder, each individual shell is charged with gas that is used to propel the BB held within the shell. 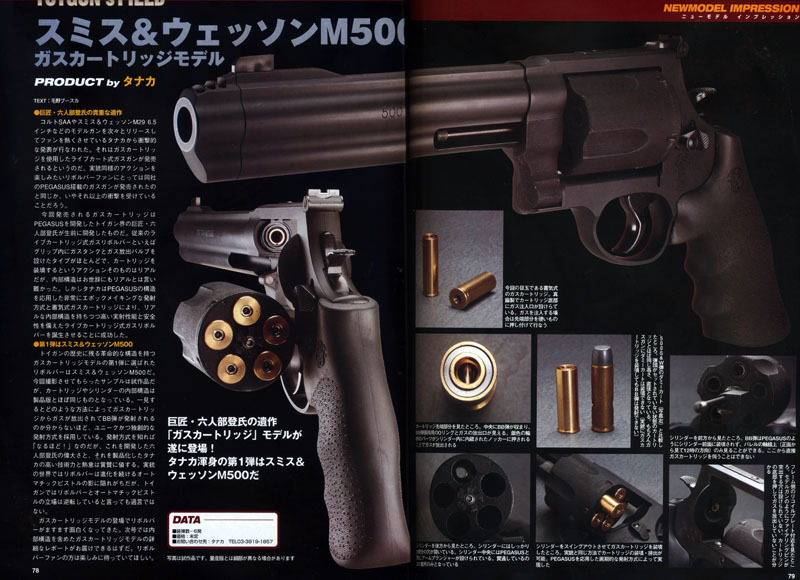 Some may feel that it is a bit troublesome, but that's what makes revolvers so intriguing to play with, if you don't want the hassle then a semi-auto blowback pistol is probably more to your liking, revolver fans will most likely appreciate this little gem from Tanaka. A cartridge stand is included to make loading and charging the shells easier.